This year’s Macworld | iWorld wasn’t only about accessories and apps—attendees also got a chance to see the inner workings of the brain. Professor Stephen J. Smith of Stanford University hosted a tech talk Friday to showcase his work, a video created using Mac tools that give viewers a virtual tour inside a mouse’s brain. “The images we were capturing with this technology were incredibly beautiful, and I wanted to share it,” explained Smith, a professor of molecular and cellular physiology. Using a new method called array tomography, Smith and a team of post-doctorate and graduate students were able to take a brain sample from a common field mouse and slice it up into several pieces. The team then bonded the samples to a cover slip—a thin piece of glass—and took high-res photographs of them. The team collated the resulting photos to produce 3-D images from the 2-D samples. All of the data and images were housed on a 45TB server. The technology allowed the team to produce images that had up to 50 times higher volumetric resolution compared to older imaging techniques. For Smith, the fun part was putting all of that work together. Once his lab captured the images, his team used a variety of computer systems to process those images. Most important, though—and most relevant to Macworld | iWorld attendees—were the army of Mac Pros and MacBook Pros that did a bulk of the work. Smith also used Final Cut Studio to edit the images together into a film; his daughter even created an original score through GarageBand. The finished product, titled “Synaptaesthesia” was stunning. The short film took audience members on a journey through the six layers of the somatosensory cortex of the brain. 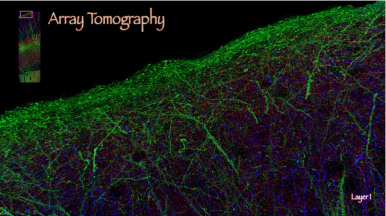 As the images descended down the cortex, red synapses, blue axons, dendrites, and green neurons lit up the screen. Smith ended the talk by saying he hopes to produce more films lik this in the future. The video is available to watch on YouTube, and you can learn more about Smith’s work on his website.